The Brass Chamber Music Workshop at Humboldt State University (BCMW) welcomes musicians of all ability levels to a one-of-a-kind opportunity to play chamber music for brass instruments. BCMW’s unique workshop setting and extensive music library provide participants with the opportunity to play in a variety of ensembles, ranging from trios to dectets, with coaching by some of the finest brass players on the West Coast. Each evening the participants perform for each other in a casual and supportive environment. 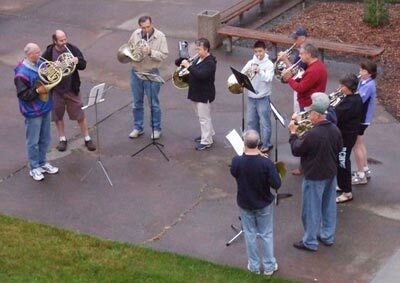 In addition, there are special-interest sessions on brass-related topics, and ample time for participants to put together groups of their own making for further ensemble playing. BCMW is known for its relaxed atmosphere and the camaraderie amongst its participants, and for its support for promoting the creation of new music. Come join us amidst the spectacular scenery of California’s north coast for fun, friendship, and great music!